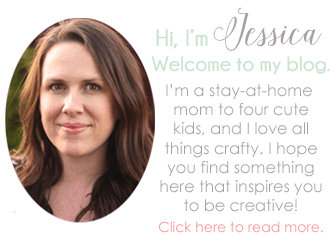 This is a sponsored post written by me for I Love to Create (Tulip) and Blueprint Social. All opinions are my own. We’re counting down to Halloween in our house and doing some fun Halloween crafts with the kids. 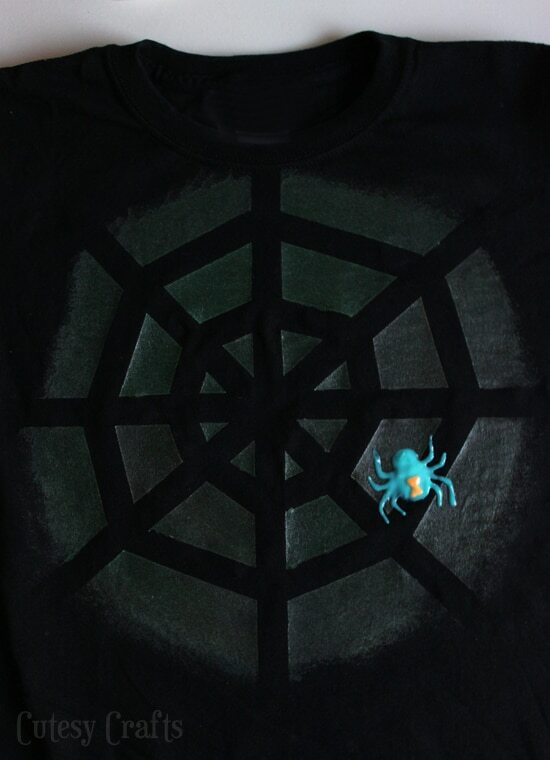 Evan and I used Tulip glow paint to make this really cool spiderweb shirt for Halloween. 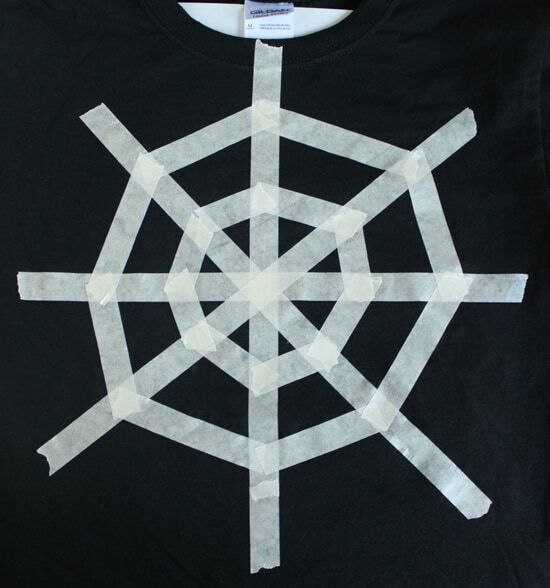 It’s really easy for the kids to help with because the design is laid out with tape, like a reverse stencil. You know how much I love reverse stencils lately. I also love that the shirt looks great in the day or night. This paint could be so fun for decorating Halloween costumes, trick-or-treat bags, foam pumpkins, glass, metal and wood items! 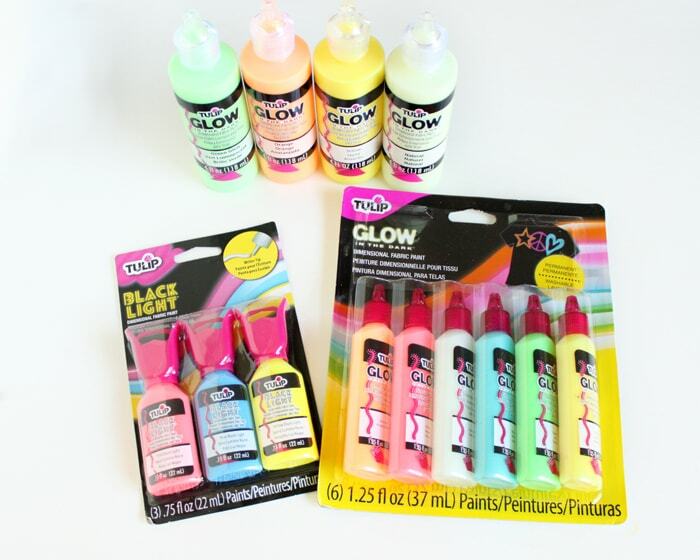 All of the paints glow very well under a black light, and they even make a special black light paint. 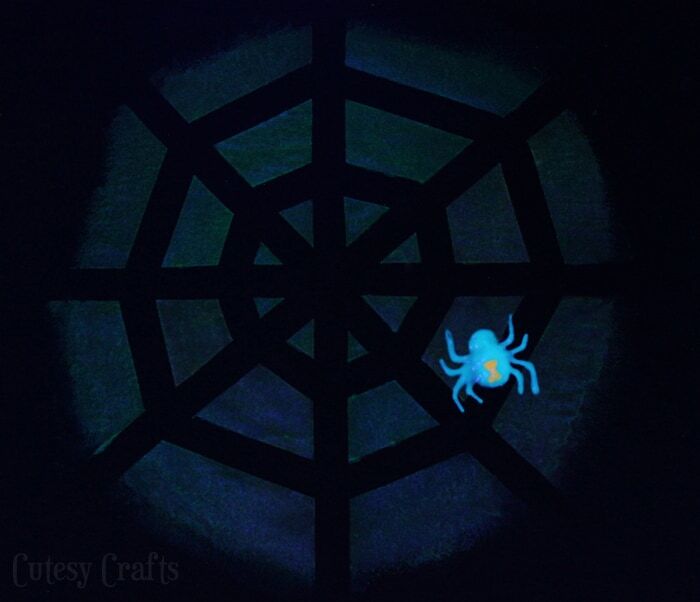 Perfect for a Halloween black light party! Tulip Fabric Paints are also nontoxic and formulated for lasting adhesion to fabric, so your designs stay dimensional and won’t crack or peel, wash after wash. 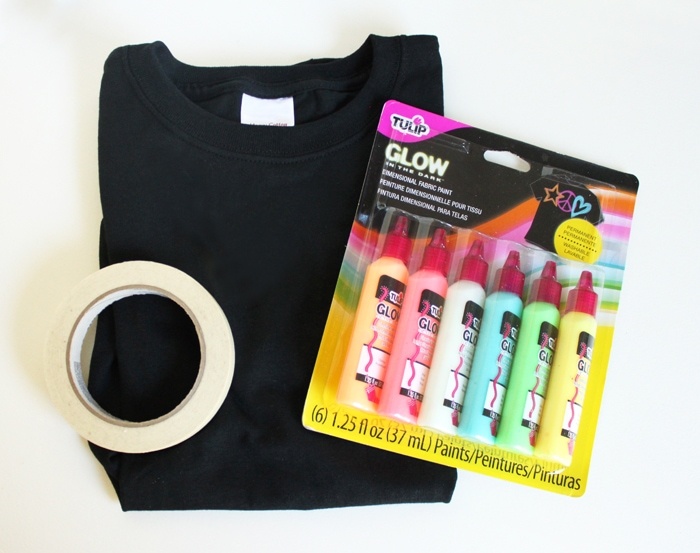 Put a piece of wax paper or cardboard in the middle of the shirt to prevent any paint from bleeding through. 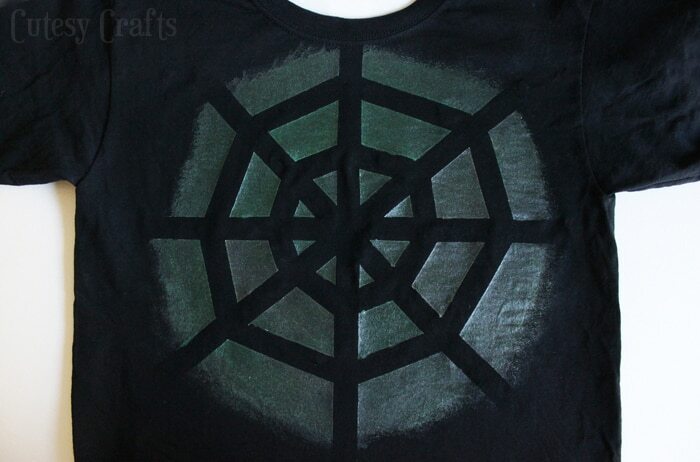 Tape out a spiderweb design on the front of the shirt. Brush 2-4 coats of paint over the web, letting the paint dry to the touch between each coat. The more coats you put on, the more it will glow. This part would be great for the kids to do themselves! 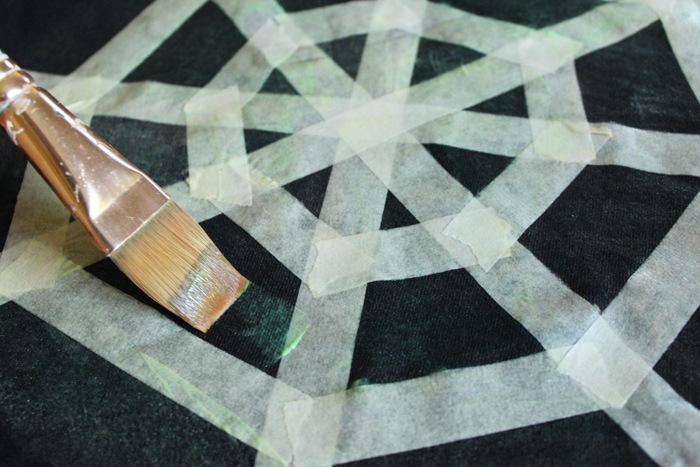 Let your final coat dry completely and then peel off the tape. 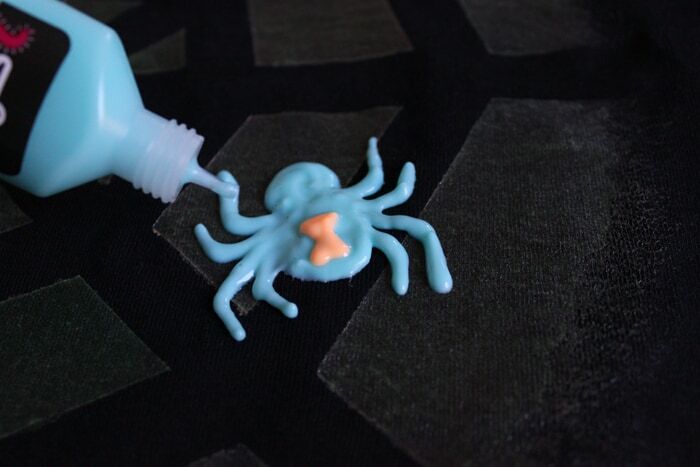 Squeeze paint out of the tubes, directly onto the shirt, to make a spider that lives in the web. We’ve got lots of black widows around here right now, so this guy seemed only fitting. This is such a cute and super clever idea! Love it.